I have been flirting with Chi Running for a while now. I first heard about it a number of months ago and was intrigued by its claim of being a ‘revolutionary approach to effortless, injury free running’. So when I found out that my favourite London running shop Run and Become was holding a free Chi Running workshop I thought I’d go along and find out some more. Anyone else who has tried to learn Chi Running will know that there’s quite a lot to take on board when you first start out with the technique and I found it difficult to know whether I was doing it right. I pretty much gave up trying while I focussed on training for the Great South Run. Then a few weeks ago I found out that Run and Become were starting up a regular Thursday night Chi Running Club led by a qualified Chi Running instructor Balavan Thomas. I thought this would be a perfect way to get back into using the technique and hopefully learn some more, so I went along a couple of weeks ago. The session started with us going to a local park to warm up and do a series of body looseners focussed on mobilising various parts of the body that are important in Chi Running – the ankles, knees, hips and spine in particular. Balavan then gave us a couple of form focusses to concentrate on as we set off on a 5K run around St James’ and Green Park. We then came back and did some stretching to cool down. The session bought back a lot of the things that I had read and I realised how much easier it would be to learn with someone teaching me rather than trying to read it from a book. So when Balavan mentioned he was doing a special offer on 121 coaching during November I was sold. 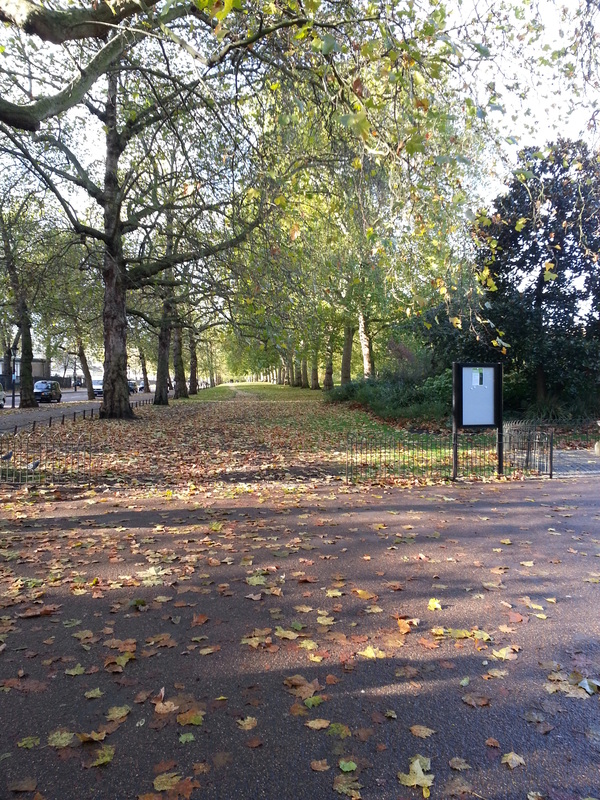 I booked for 3 hrs of coaching with Balavan split into two sessions which took place on Monday and Wednesday this week in a beautifully autumnal St James’ Park. 1) Softening the knees – Balavan noticed almost immediately that I have a tendency to lock my knees out when I’m standing straight. I had never realised this before but am now much more aware of it and need to focus on having a microbend in my knees at all times – I manage it during a yoga class so I now need to bring that into the rest of my day. 2) Landing on the mid/whole foot – Balavan also noticed that I tend to land on the ball of my foot rather than the midfoot, sometimes looking like I’m running on my toes! This could well be the reason why my calves have suffered so much since I’ve been running. Chi Running recommends landing on your midfoot or ‘whole foot’, making sure that the heel touches the floor but never heel striking. To help with this Balavan recommends thinking ‘whole foot’ as I’m running and really softening into the ground as I land. 3) Levelling my pelvis – Chi Running is all about running from the core by engaging your lower abdominals and levelling your pelvis. Again this is something that I practice in yoga but Balavan has also recommended some other Chi Running exercises that will help to strengthen my lower abdominals and help me to keep my pelvis level when I’m running. 4) Using my arms – in Chi Running 50% of the effort should come from the upper body and arms and only 50% from the legs. I have never really got my arms involved in my running in a big way – they’ve just swung backwards and forwards but I’ve now learned a technique which means that I’m using them much more and feel like I have far more power when running by doing so. 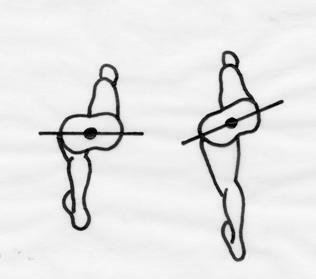 5) Pelvic rotation – I (and apparently a lot of women) have a tendency to swing my pelvis from side to side when I run. This can lead to ITB problems which is something that I experience quite a lot. By learning to rotate my pelvis backwards, as shown in the diagram below, I can reduce this side to side motion and decrease my likelihood of IT band problems. 6) Shoulders down and pointing forward – I have a real issue with hunched shoulders. In Chi Running the idea is to keep your shoulders relaxed, away from your ears and pointing straight forwards like headlamps rather than swinging backwards and forwards. The armswinging motion that I’ve learned really helps with this. 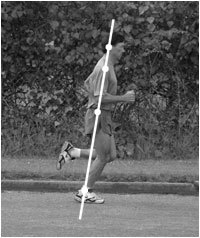 7) Lean – one of the things that people most associate with the Chi Running technique is the lean – you lean your whole body slightly forward from the ankles, not from the waist and increase this lean and stride length while keeping your cadence steady to increase speed. Balavan thinks that one of the reasons I may have struggled to increase my speed is that I’ve been running too upright, using my leg muscles to ‘push off’ from the ground all the time, therefore tiring them out quicker. By learning to lean I can use the force of gravity to help increase my speed without increasing the effort I’m expending. Sounds good to me! There really is a lot for me to think about and learn! Balavan recommends that I choose a couple of difference focusses each time I go out for a run and switch inbetween these for a few minutes at a time. With time it should feel like less of an effort to focus on these things and eventually it will become my natural style of running, but this may well take a few months, perhaps more. I went for a run on Tuesday in between my sessions and picked a couple of the focusses to work on, switching between them as Balavan suggested. Sometimes my mind would wander but as soon as I noticed I would re-focus and come back to thinking about my form. One unexpected side effect of concentrating so much on my form was that I ran non-stop for 30mins without realising. Usually I would have ‘needed’ to take a quick walking break at some point during that run but I was paying so much attention to my form that I forgot about that. Whoever said that running was just as much mental as it is physical was a very wise person indeed! I really enjoyed my sessions with Balavan, I’ve learned so much about how I can improve my running technique to make me a more efficient runner and less prone to injury. I’m looking forward to putting all this into practice. It’s going to take time and some patience I think but I think the results will be worth it. Wow that is really interesting. Couple of things slightly different from barefoot running and a couple of things that might enhance the barefoot running. Thanks for sharing! No problem 🙂 I do think it’s a little bit different to the barefoot style but in many ways quite similar. Balavan actually has both of the pairs of minimal shoes that I have (the men’s versions) which was quite interesting – he’s not against being totally barefoot but doesn’t necessarily think it adds anything from a Chi Running perspective. I still think I’m going to wait a while for my Vibrams. Wow, thanks for the post – quite fascinating. I think I could definitely benefit from some of this kind of training – I hunch my shoulders and end up with really tight neck/shoulders/back and I think I swing my hips/pelvis too! Can you make it along to the Running Club at Run & Become? It’s a really good place to start and you’d get to meet Balavan as he leads it. He also does group sessions and there’s a free workshop coming up at the store in November as well. Fabulous post Becca and a really great summary of your Chi Running experiences. I need to get along to a session – maybe next week when I’m recovered from this ridiculous cold! Chi Running is super interesting. But not much fun learning it from a book… after all you rarely see yourself running. I read about a lot of the factors but I think that the “whole foot” thing is something I should try and work on. Thanks for the fabulous run-down. It made so much more sense to have someone explain it to me. I went for a run today and concentrated on the ‘whole foot’ landing. I think I was getting there. Good luck! Really? I thought there were loads of coaches in the US? Balavan is great though so if you can wait till you’re here then you won’t be disappointed! That’s brilliant! And what a small world – Wimbledon is just down the road from where I grew up in Surbiton! There really is so much to learn with Chi Running but this is a great rundown of the major elements. I’ve been learning from the book for the past few months (after taking a workshop) but I think a private session would be tremendously beneficial. Good luck to you and your form focuses! Thanks. I found the one to one session really useful as it focussed in on the things which I was struggling with. Some of it comes naturally but other parts are going to take me some time to master. But I like that about it – it means that everytime you go out for a run there’s something difference to concentrate on and get better at. Rather than just ‘running’ each run now has a real focus and that works well for me. Good luck with your Chi journey too!